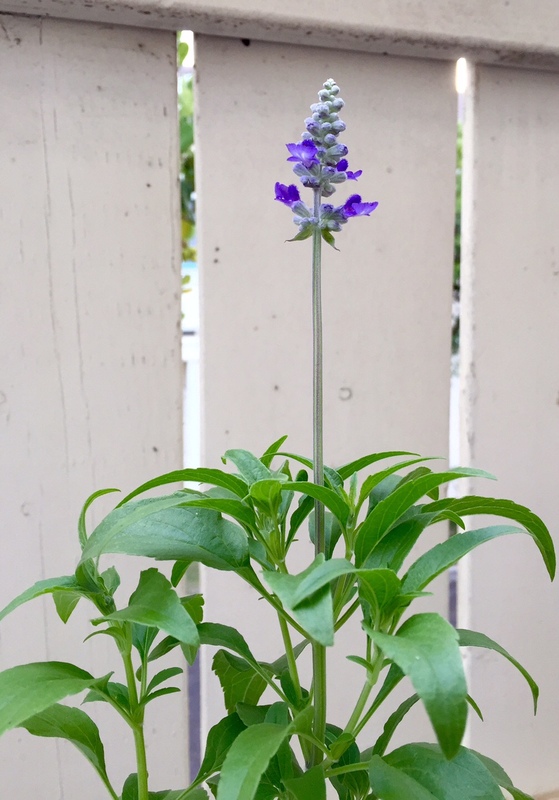 ALOHA FROM JENNIE aka Novice Gardener: This page was started to support newbies who wish to take up gardening. The National Gardening Association reported last year that one in three U.S. households have a food garden, and 63% of millennials now garden. Surely all these people must find some fulfillment in gardening, I thought. There must be more to life than enjoying mangoes from other backyards, or marveling at the beauty of cut floral arrangements. Thus, as I enter my fifties, I begin my journey to make things flourish with Mother Earth. My hope in chronicling our (mis)adventures is that we can chuckle together, and with any luck, lure the many green thumbers out there for whom gardening is a passion to take pity on us and share their tips here. Welcome to our online gardening community! I’ve settled into a pattern where I’ll pick up colorful plants, like the hibiscus and sunflower perennials shown above, and within several days, the flowers will crumple and fall off. I’ll then mist the foliage at sunrise and sunset, resulting in healthy large leaves, but no new colorful blossoms, although we have quite a number of perky unopened buds. I’ve resorted to buying plants with colorful leaves in order to break the green monotony. Here, I scored an $8 bromeliad bulging out of its ‘small’ container, even though it was the same size as the $16 ‘medium’ units had it only been repotted. I brought the plant to Linda who has decades of green thumb experience including working with delicate orchids, and watched her line a large pot with cinder block pieces and mix new soil with the old root system. For the hibiscuses, she tweaked off spent leaves and explained that plants expend energy in growing, so non-desirable areas should be trimmed and thus avoid diverting efforts away from the healthy stems. 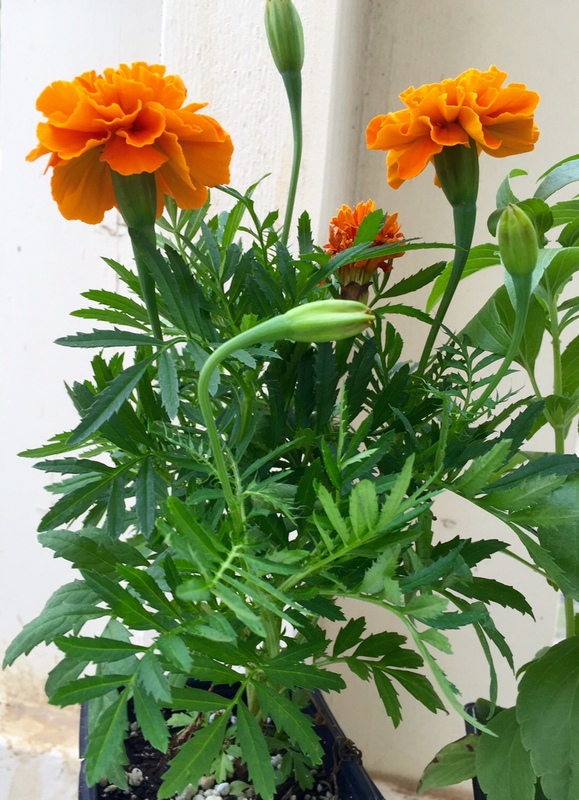 I watched her reach long fingers towards a cluster of leaves that I had been nurturing for a week, ever since I noticed them breaking out of the dark soil and extending upwards, growing a thick stem and symmetrical leaves. I waited for some nice commentary, but was instead startled when Linda deftly pulled out the entire plant and tossed it into the trash pile. Apparently that is what one does to weeds! A week later, I brought the plants over to another green thumber, Claudia, whose garden is the envy of all our neighbors. Like cats and dogs that are anonymously left at pet shelters, people have laid plants at Claudia’s doorstep because they’d be ‘better off’ with her. Claudia pronounced the hibiscuses as healthy but pointed out that the containers were very light, a sure sign that I had let the soil go bone dry. Half a cup of water daily evaporates very quickly, so I’ve had to increase my watering. 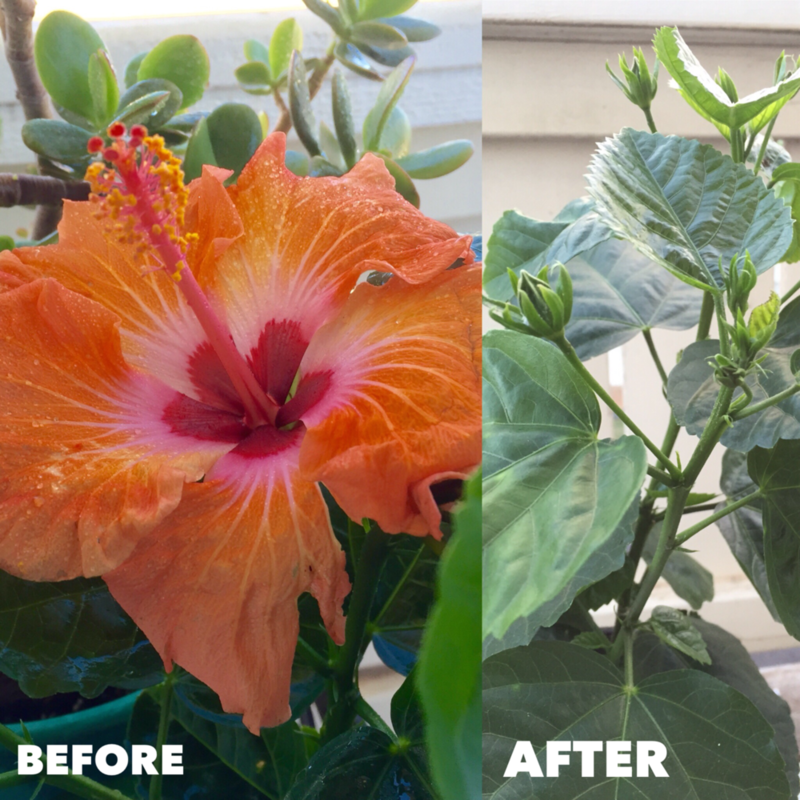 Because each hibiscus can grow quite large, Claudia explained that I needed to decide whether I wanted a vertical or horizontal plant, envision the growth path of the various stems and cut accordingly. It sounds like a mixture of science and artisan talent, so I fear I will end up with an unruly blob. Claudia then generously sent me off with new pots and a year's supply of epsom salts for water treatment. With Claudia's larger pots, it was as if the eldest child in a large family received new clothes. 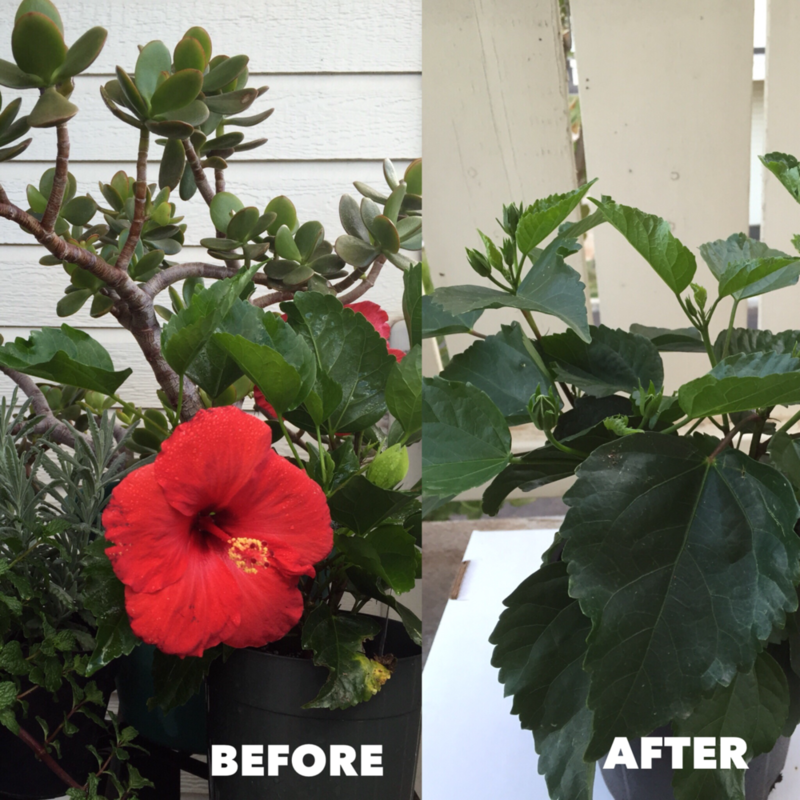 The hibiscus moved up to the newest containers, and the smaller plants upgraded to the larger hand-me-downs. Then everyone got a bath of epsom salts (one tablespoon per gallon of water) via a good soaking so that their soil is finally fully moist. Hopefully this will tide these finicky plants over for a while. Well, it’s been an interesting four week journey with lots more to learn. Have we inspired you as a newbie to consider a garden at some level? Can some of you experienced pros share tips (especially on ant control)? We’ll continue to post garden updates here. In the meantime, mahalo (thank you) for visiting! Well, after two weeks of misting and watering, with a dozen hibiscus buds peeking but not venturing out, we have the miracle of blooming, and most surprisingly to us newbies, overnight! Had I known flowers evolved this quickly, I would have tried to figure out a timelapse recording. It's remarkable how quickly the full colors of a hibiscus flower appeared, and like any proud parent, we marvel at its perfect delicateness. For those of you who wonder why there are millions of gardeners, this fulfillment may be one of the reasons. We won't think about the potential heartbreak of sunburn or pests (or the windy, rainy hurricane season upon us), but rather simply enjoy the moment and smell the flowers. I hope that all of you are having equally rewarding experiences, and will share your creations by Mother Nature. Part Two: It turns out that hibiscus flowers are very delicate, green thumber Claudia called them 'one-day flowers' because the blossoms do fade and drop off within a day or two. The cycle seems to be that the delicate untouched petals open at night or early in the morning and display their glorious colors, and then by nightfall, the flower closes up and drops off, with the bud soon following, leaving only the stem. I wonder if each flower knows that they only have a day to embrace the world, and whether they get to pick their day, when the conditions are right, as opposed to during a rainstorm. Above is a series of the next two buds blooming right after the first one, so we then enjoyed twins. There are a number of unopened buds in different stages, so the growth will appear in layers. Hopefully, we'll enjoy new flowers every week or so. As the oldest island in the Hawaiian chain, Kauai receives the most rainfall, and is known as the Garden Isle. 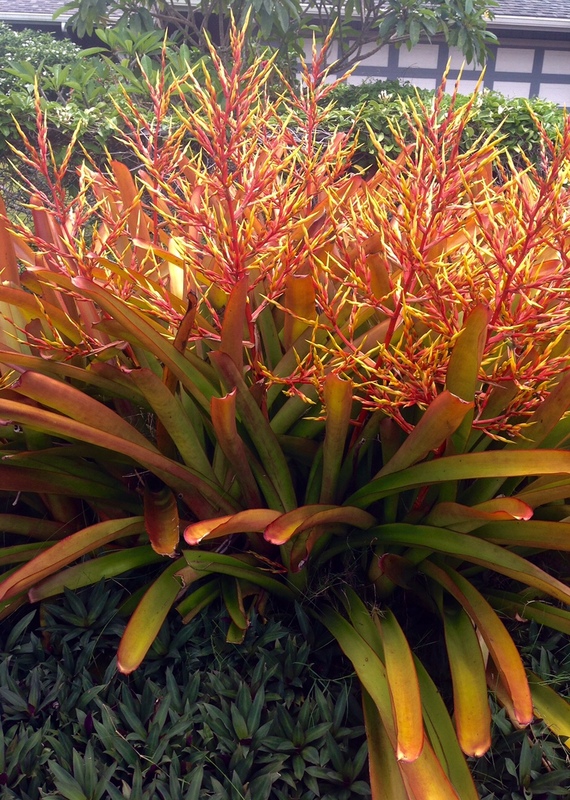 The humidity creates a lush environment that bromeliads thrive in, as you can see from these beautiful photos--the plants grow in the wild, even making their way up palm trees, without any intervention by gardeners. I recently re-potted my two bromeliads after realizing that their root systems can't sit in moist soil, apparently the bulb rots easily. Their preferred media is peat moss and bark chips so that the water will quickly drain. I also learned to put a little water in the base reservoir where all of the leaves overlap to form a rosette. One of our seniors brought back these photos during her recent swing through this tiny island, and I'm inspired by the use of natural materials in landscaping gardens. Here's a lava rock creation with an Asian garden flair, and an orchid showing off its beautiful colors and delicate petals. Isn't it fun to see ultimate gardens that we can work towards?